HomeBlogHow will the Facebook Star Ratings affect Businesses? How will the Facebook Star Ratings affect Businesses? 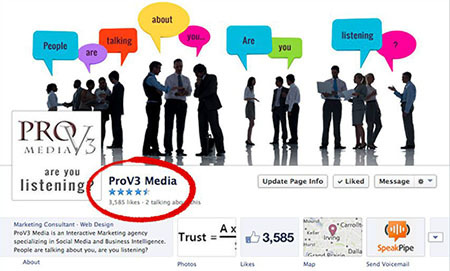 In the last few weeks, you may have noticed that your Facebook page has a brand new feature. Underneath your page name, there may be a set of five stars that indicate how people feel about your company. Although this isn’t a completely new concept, allowing this information to be publicly displayed IS brand new. This significant change in the display of your Facebook page will have two major effects. First, it shows the public’s general sentiment towards your business and social media content in a higher capacity than just your “Like” volume. A Like only shows how present an entity is, but not how people feel about it. Second, this five-star system will easily show what your page viewers may or may not already see by evaluating your page likes and comments. Your page visitors will see this rating first. They will most likely not take into account your number of Facebook Likes nor read the comments that explain why the five-star rating is what it is. Several questions have been raised in response to this new system. Some wonder if the number of people who rated the business will be shown. Others ask if ranks given by certain users will have a different weight based on their number of connections or when they gave their rating. Facebook has even been questioned about how it will handle false ratings that are only intended to inflate company ratings instead of providing honest evaluations. It is not yet known whether companies will be obligated to display the new star rating. If Facebook moves to compete with other popular review-based sites such as Yelp, Foursquare, and Angie’s List, then this new feature could significantly change how businesses use their Facebook pages. Given the wide adoption of Facebook as a key marketing tool, companies could be forced to look at ways to improve customer service while also stepping up social media engagement in order to maintain a favorable star rating (which is always a good thing, from a consumer standpoint! ).